6 for $114.00 total Need more quantities? A velvety red that leans toward the blue end of the spectrum and resists fading. Blooms are very large and very frilly, and they float above clean, dark green foliage on 38″ stems. Visitors at Peony time will make this their first stop. Mr. Wild has been absent from our offering for several years as we built up stock, and we're delighted to welcome him back. We ship large roots with 3—5 eyes that are fresh from the growing fields. While a newly planted Peony seldom makes a first-class show in its first season, these vigorous plants will reach the top of their form in their second or third year. Southern gardeners should seek out our early bloomers and provide afternoon shade. 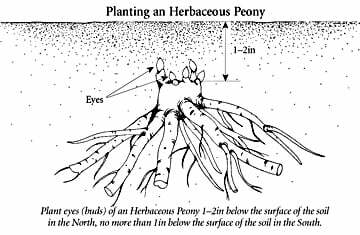 For more information on growing Peonies, click on Growing Guide. I bought this in 2005 from a Canadian source, planted it in a nursery container on my 5th floor balcony facing north and west. Came up in May. Beautiful, but a bit more on the pink/red side.